How do Du interpret this? 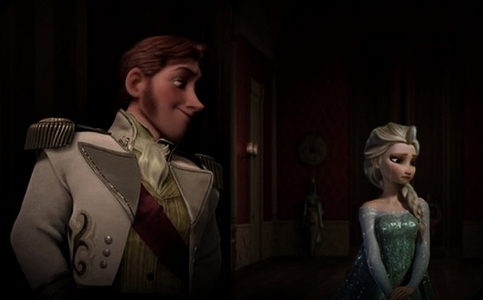 What do Du think is happening in this picture with Hans and Elsa? I just photoshoped/edited this Foto today, but I wanted to know what Du guys thought. I have an idea of what I was trying to convey... however, I want to know if anyone else sees it the same way oder not. Sorry, I know I gepostet this on the Zufällig club as well, but I wanted to post it here as well... since this is the Frozen club. Since I don't ship Helsa, I interpret it like, Hans is ruining Arendelle, and all Elsa could do was cry about it... oder something... Hans could be spying here. Another idea is the picture could be somehow cut off. There may be another half where Elsa could be talking to Anna... about a subject that made her cry, and Hans was eavesdropping. Pictures hold millions of words and messages. How about you? How do Du interpret it?